BMW iPod integration kit, full iPod control from your BMW Original radio, this USA spec iPod integration kit allows you to connect listen control and charge your iPod iPhone from the factory BMW car stereo and steering controls. Late 2003 BMW radios will display iPod text, you can scroll through your songs playlists artist titles, shift between tracks and up to five BMW playlists and adjust volume without taking your eyes off the road or your ears off the music. You may also, select “Random” and let the music take you to unexpected places if using an iPhone you can also listen to internet services live Pandora, Livio radio or online satellite radio comes with second audio input port for any other audio source. 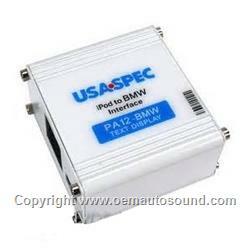 Directs the iPod's audio output to your factory BMW audio system for optimal sound. Controls the iPod via vehicle's radio and steering wheel controls. Charges the iPod's internal battery; charging stops automatically one hour after the iPod is paused, the iPod goes into sleep mode when charging stops 5v USB. All control functions on your iPod are available, you can search and select music on your iPod directly just as you would when using it as a portable unit, you can also still use the track up down, fast forward and reverse button on your radio to control music playback. Artist name and song title information can be displayed on BMW's Business CD model radio. All audio tracks on the iPod will be played at Disc 6. The track order is determined by the default order on the iPod. Selecting discs 1 through 5 on the factory radio will allow playback of 5 playlists on the iPod if the Aux Input is not used. You can select a playlist by pressing the Disc Up or Disc Down buttons. 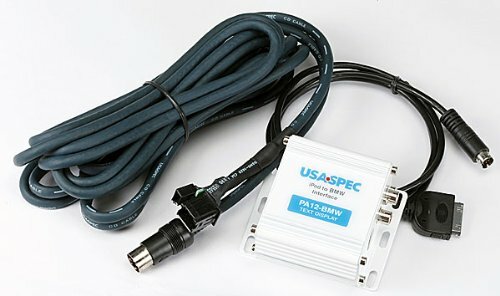 In order for the adapter/factory radio to recognize a playlist, it must be named BMW 1...through Bmw5... Text can follow the BMW name and number, such as BMW 3_artist name or Bmw2-jazz. For a given disc slot (1-5), if there is no playlist named BMW followed by that number, that disc slot will not be available. In addition to the iPod input on the PA12-Bmw there is an auxiliary input (stereo RCA) for use with another source, such as a DVD system, satellite radio, or game system. The aux input is selected at Cd 6 Track 1 using the factory radio controls. This aux input can be used with or without the iPod connected. When the Aux input is used, the "All Tracks" playlist is moved to Disc 5, and playlist "BMW5" is lost. I recently purchased the BMW PA-12 The install was simple it plugs into the cd changer connection works as advertised text scrolls on radio and all controls work on using the BMW Business CD radio. good sound quality Great product.